There are two kinds of cabin fever. Gayle and Evan Peterson had the good kind — the kind that whispers a memory and teases of the future. A fever that starts low-grade, intensifying to the point that owning a log cabin is the only cure. After they were married, Gayle and Evan, who had been sweethearts through high school and college, were drawn to waterfront weekend escapes with their own boys, boating and swimming in the lake just as Evan had as a child. Some 40 years later, as the couple contemplated retirement, cabin fever began to rage. During their lives together, they had built four custom homes and were living in the last one in Texas with a second home in Florida. However, both homes were too far from their two sons who were now grown with families of their own. 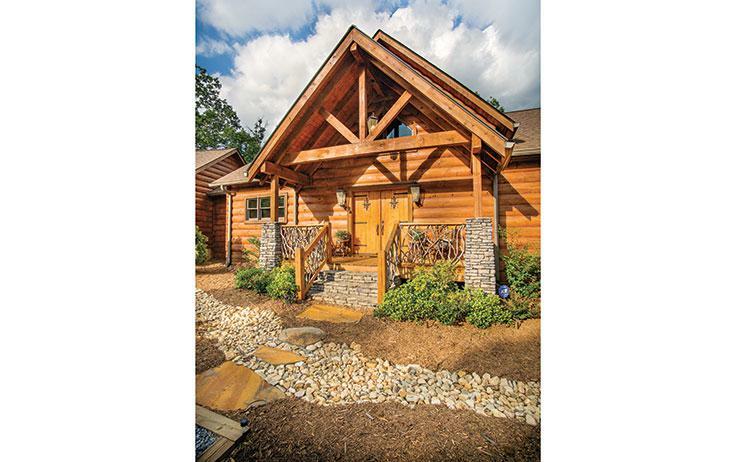 “After a great deal of research, we flew to North Carolina to look at property and met a couple who would become our guides and confidants for the next three years,” explains Evan, referring to Honest Abe Log Homes independent dealers Darlene and Rodger Dawson, owners of Bear’s Den Log Homes. That weekend they bought land at Grandview Peaks near Nebo, North Carolina, almost 1,400 miles from their home. “Soon Gayle and Darlene started designing the cabin,” Evan says, laughing at the word “cabin” and remembering that over the two years spent developing a final plan, the house grew, then shrunk, then grew again. 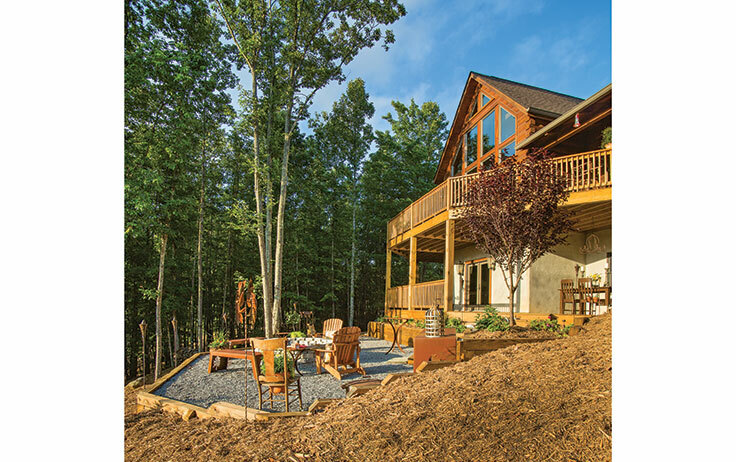 Manufactured by Honest Abe Log Homes in Moss, Tennessee, the resulting 3,250- square-foot “cabin” is a custom designed, three-bedroom D-log home with a heart-stopping view from any of its 18 windows that face the Blue Ridge Mountains. Evan and Gayle agree that the cabin has become far more than a retirement home. With their boat moored nearby, they re-create for their grandchildren some of the memories that stoked their fervor — and fever — for a cabin. 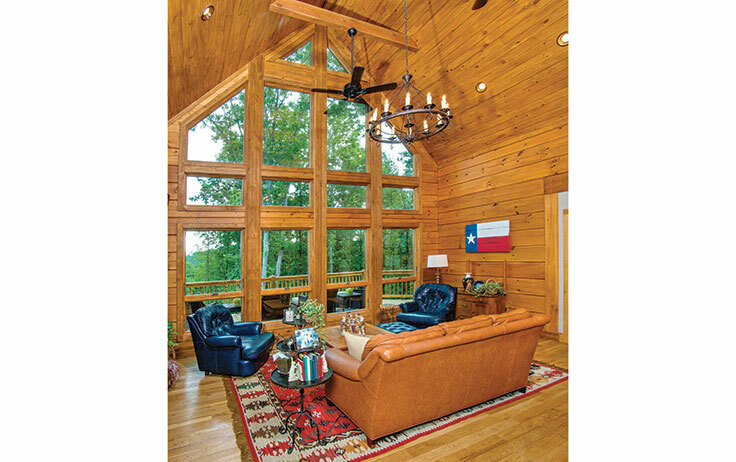 Builder: Carolina Builders Services, Inc.
To complement the log interior, the Petersons chose drywall painted with a custom-mixed light gray shade for all non-wood wall surfaces throughout the house. 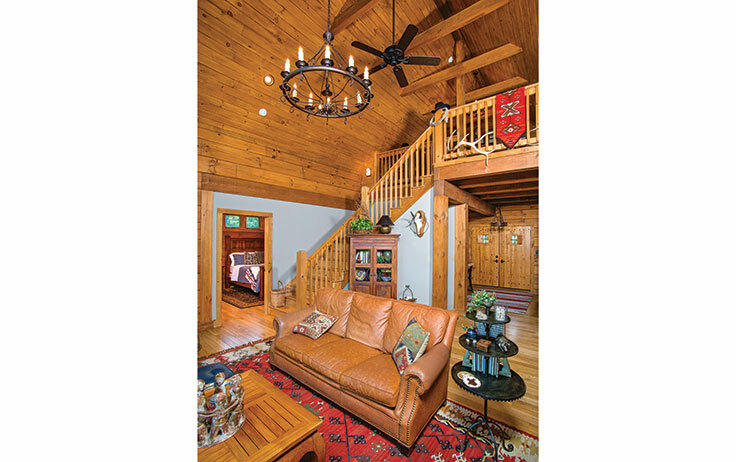 To capture a rustic feel, the couple requested that the staircase posts and trusses remain rough with only a light sanding applied. 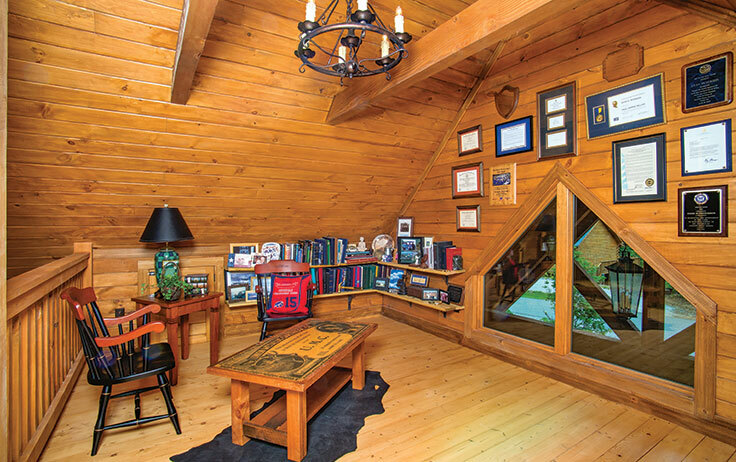 Capturing mountain vistas and flooding the great room with light, windows stretch from the vaulted ceiling to the hardwood floors. Flanked by the master bedroom suite and the kitchen and dining area, the great room offers access to a wide, open loft. 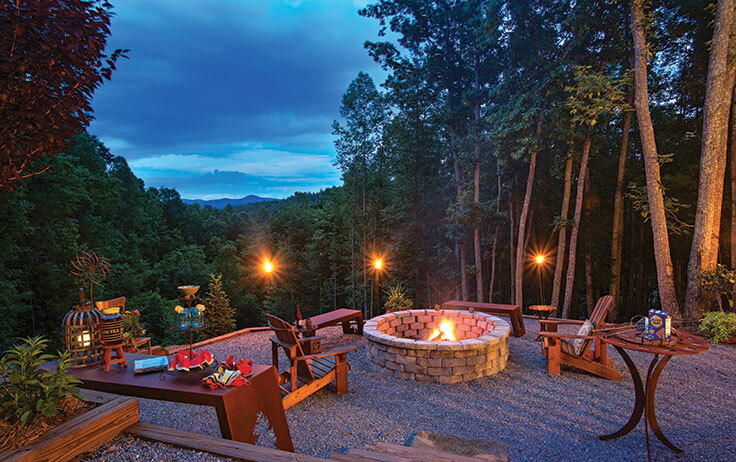 The Petersons savor the luscious Blue Ridge landscape from the rear of their house, which was designed for relaxation on three levels: A 210-square-foot upper deck spanning the main floor, a lower deck off the stucco-finished basement and gravel patio with a fire pit. 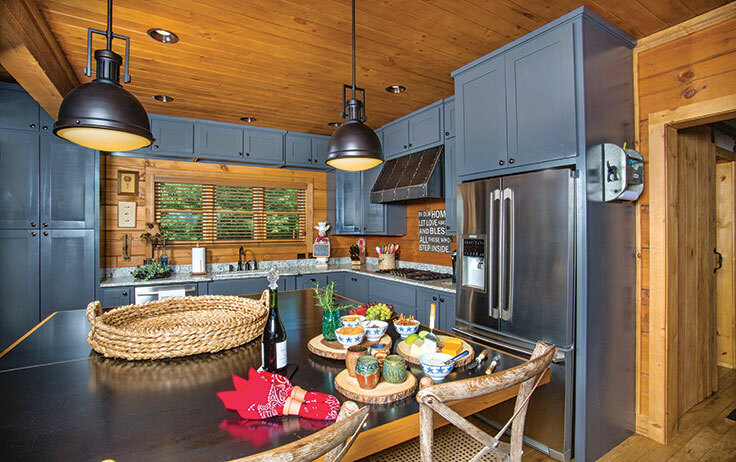 Gayle’s choice of simple, gray-painted custom cabinets creates a striking contrast to the natural log walls and wood ceiling. Additional storage is provided by a separate walk-in pantry. The center island seats six and has ample room for food prep on the 1/4-inch rolled steel countertop that matches the stove hood. Evan’s loft office was designed for maximum use of a small space. A baseboard window adds light and peeks through the front porch gable, while low bookshelves take advantage of the room’s knee walls. A custom metal piece by Chip Gerber of Steel Forest Furniture, this table is positioned comfortably before a great room fireplace of cultured stone and warmed by a gas insert. Patio doors open onto a screened porch. 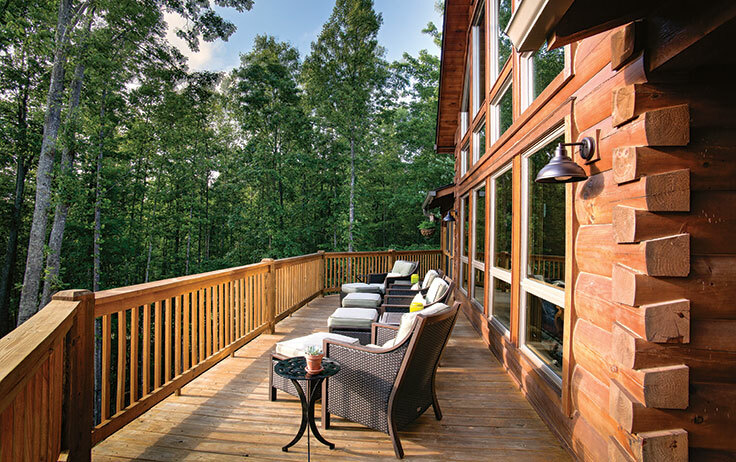 Spanning the main floor’s mountain-facing side is a 210-square-foot open deck that becomes a covered porch on one end and a screened-in sitting room off the other. 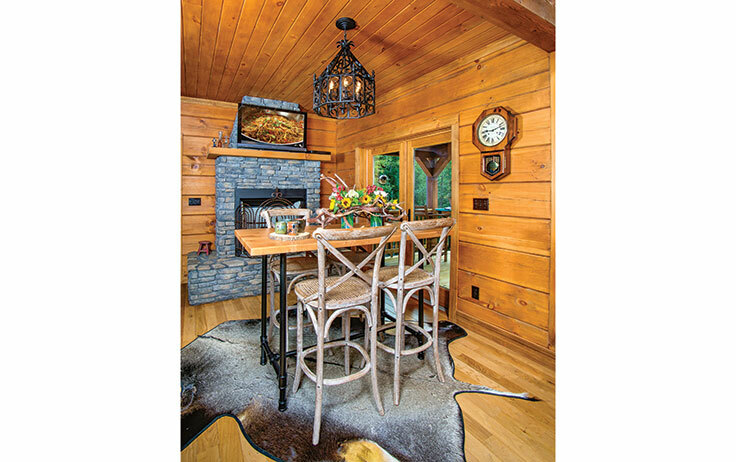 Darlene Dawson, owner of Bear’s Den Log Homes who sold the Petersons their home package and consulted with them throughout construction, says she recommends Andersen 400 double-awning windows, which create an unobstructed view while providing both ventilation and protection from rain when open. 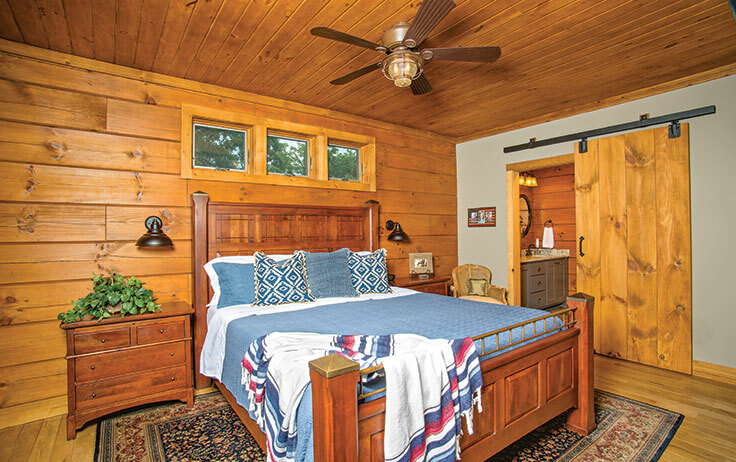 The master suite includes a full bathroom and a walk-in closet separated by a handmade, space-saving sliding door. Honest Abe dealer Darlene Dawson advises using windows positioned near the ceiling in bedrooms to allow for flexible furniture placement. 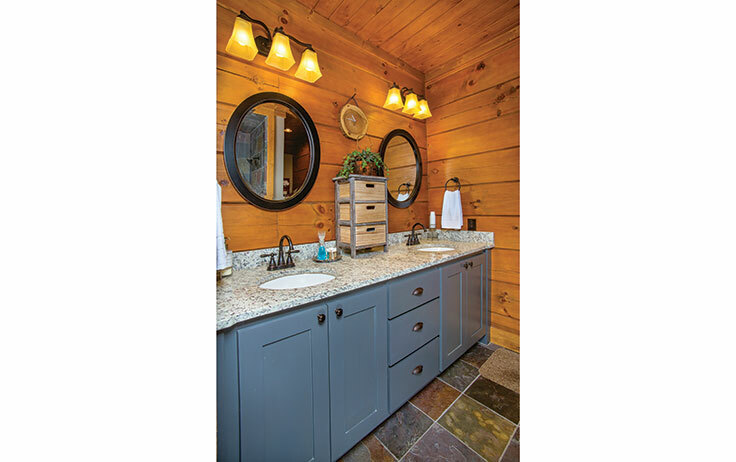 The master bathroom’s gray cabinets are topped by an accenting granite countertop with twin sinks. 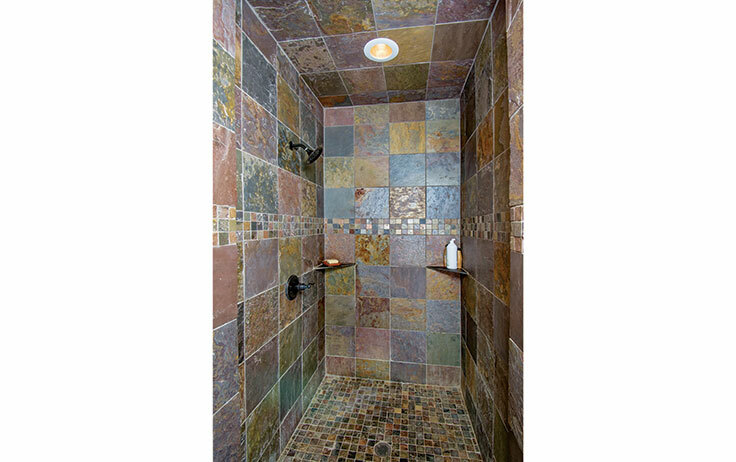 The 12-inch-square multicolored slate floor tiles carry through to the walk-in shower’s walls.